Wrap-Up -- Sometimes, all it takes is a little Love. 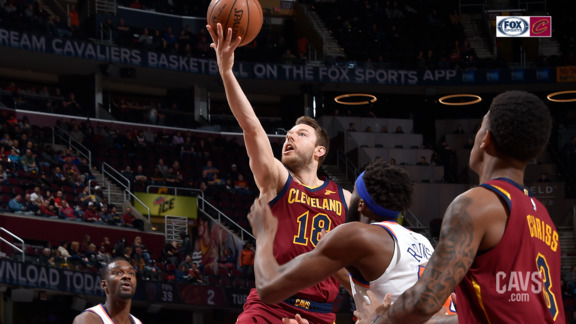 Kevin Love made his actual return from a 50-game absence on Friday night in D.C., but he started for the home folks and got a longer run on Monday night, getting the squad off to a rock-solid start as the Cavaliers went wire-to-wire against the league’s worst squad – dropping the Knicks, 107-104, at Quicken Loans Arena. 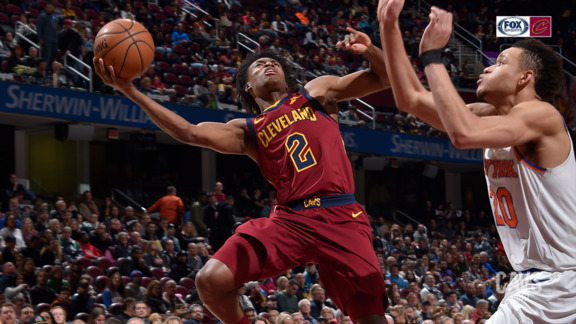 Love established himself early and his teammates followed suit – scoring 12 of his 14 points in the first period as the Cavs jumped out to a double-digit first quarter lead that they extended to 15 in the second quarter. Cleveland’s five-time All-Star didn’t see action in the second stanza and still was within a single board of a double-double in just 15 minutes of work – going 4-of-10 from the floor, including 2-of-6 from deep and 4-of-4 from the stripe to go with nine boards and an assist. Despite solid efforts all around – with six players notching double-figures – the Cavaliers still didn’t make it easy on themselves on Monday. They led by 12 points early in the fourth quarter – and by seven with 3:24 to play – before New York got to within a single point with just under a minute to play. 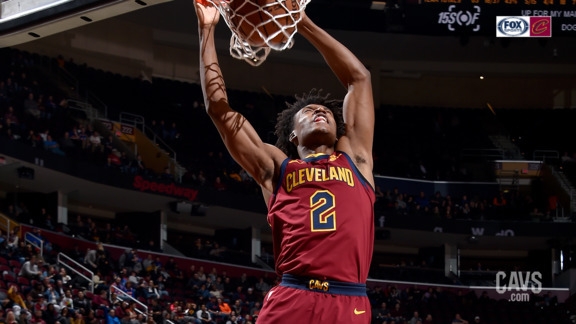 But after a sloppy closing minute by both teams, Collin Sexton sealed the deal with a pair of free throws with 17.3 to play in regulation, giving the Wine & Gold their second win over the lowly Knicks this season. Sexton led the Cavaliers with 20 points in the win – going 7-for-21 from the floor and 4-of-5 from the stripe, adding three assists and a steal. 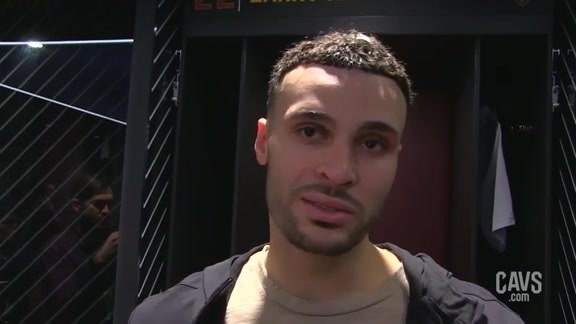 Larry Nance Jr. was outstanding again on Monday night. 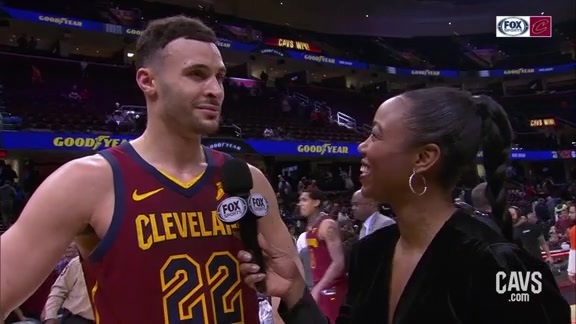 After doubling-up in back-to-back games this weekend – and the previous three – Nance notched his sixth straight double-double at The Q, finishing with 15 points and a game-high 16 boards, adding four assists, a steal and a block. Jordan Clarkson added 15 points of his own, going 6-for-17 from the floor to go with six boards and a steal in 28 minutes of work off the bench. Sexton tallies his 49th double-digit scoring effort of the season. Two other Cavalier reserves tallied double-figures off a Cleveland bench that combined for 44 points. Marquese Chriss registered double-digits for the second time in his first three games with Cleveland – chipping in with 14 points on 5-of-8 shooting, including 2-of-3 from long-range, to go with seven boards and a steal. 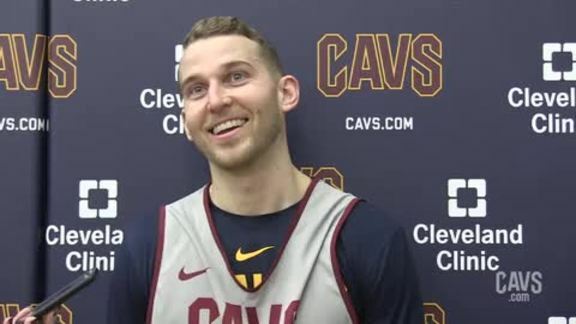 Matthew Dellavedova, who went for 15 points in the first meeting between these two teams, finished with 12 points on Monday – going 5-for-10 from the floor to go with three boards and a team-high six assists. 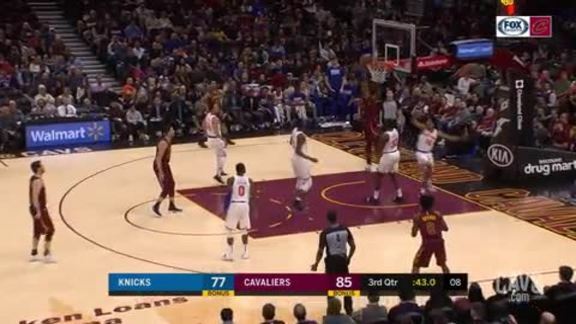 The Cavaliers canned another 14 three-pointers as well on Monday night – their third straight game hitting at least 12 trifectas after combining for just 13 in the two preceding games. The Knicks – who dropped their 17th straight game on Monday night – were led by Kadeem Allen, who led both squads with 25 points in 32 minutes of work off David Fizdale’s bench, going 10-of-16 from the floor. DeAndre Jordan doubled-up for New York, adding 12 points and 10 boards in the loss. Turning Point -- The Cavaliers never trailed on Monday night, but things got hairy towards the end of regulation. The cushion Cleveland built early on in the first half was enough to preserve the win late. 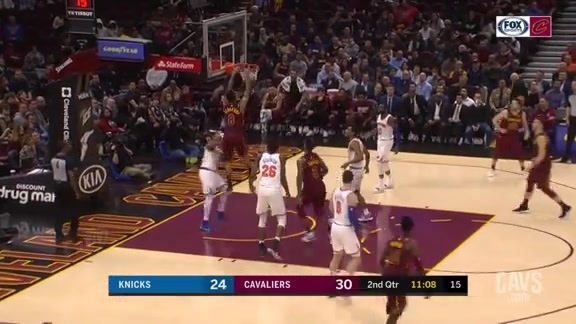 After leading by double-figures in the first period, New York cut the Cavs lead to a deuce, 36-34, with just over eight minutes to play in the first half. But the Wine & Gold went on a quick 12-2 run from there, opening up a dozen-point lead by the midway point of the period and keeping their edge at double-figures for nearly the remainder of the first half. By the Numbers – .857 … Brandon Knight’s three-point shooting percentage in two appearances with the Wine & Gold – going 3-for-4 from long-range in Monday’s start after canning all three triples he attempted on Saturday night in Indy. 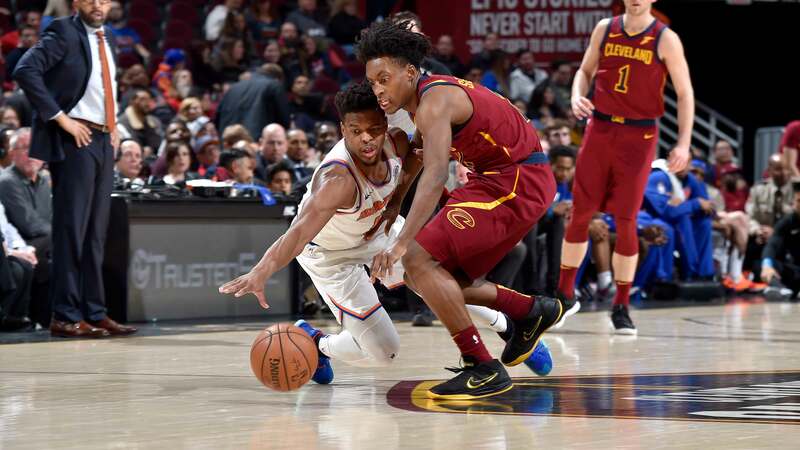 Up Next -- After knocking off the Knicks on Monday night, the Cavaliers stay home to wrap up the unofficial first half of the season – welcoming the Brooklyn Nets to Cleveland on Wednesday. With only Cedi Osman making the trip to Charlotte for All-Star Weekend, the Wine & Gold are off until February 21 – when they tip off the homestretch of the campaign against the Suns at The Q. Two nights later, the Memphis Grizzlies roll in followed by a visit from the Blazers the following Monday. Cleveland wraps up the month of February on the final day against the Knicks in New York. 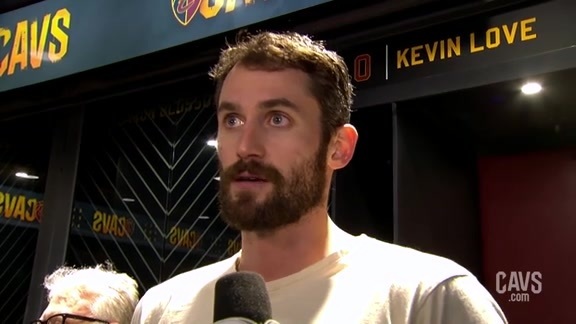 Cavaliers forward/center Kevin Love with the media following Monday's 107-104 victory over the New York Knicks at Quicken Loans Arena. 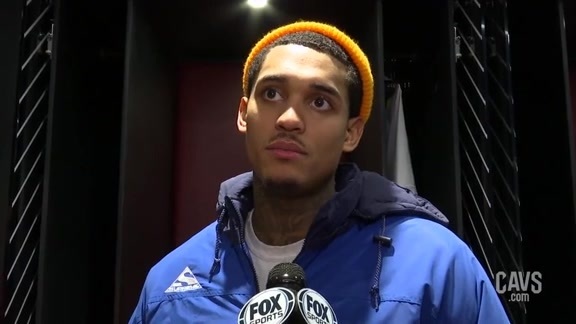 Cavaliers guard Jordan Clarkson spoke with the media following Monday's 107-104 victory over the New York Knicks at Quicken Loans Arena. 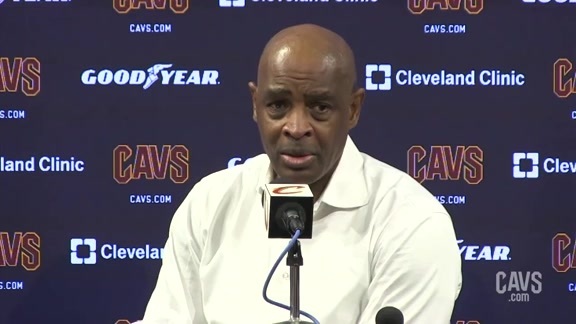 Cavaliers Head Coach Larry Drew spoke with the media following Monday's 107-104 victory over the New York Knicks at Quicken Loans Arena. Larry Nance Jr. snatches the offensive rebound and throws it down for the putback slam. Matthew Dellavedova spots Marquese Chriss under the basket and Chriss deposits the dunk with authority. 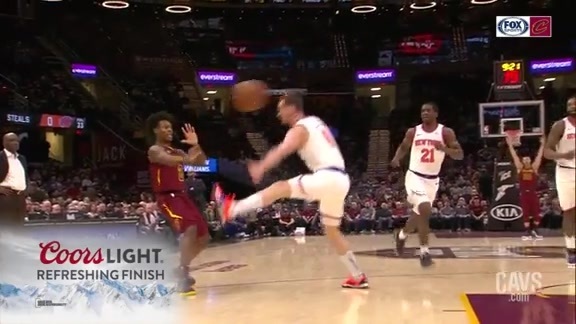 The Knicks defense dares Larry Nance Jr. to shoot the triple and he steps up and knocks it down. Collin Sexton gets bumped darting through the lane and somehow manages to toss in the shot, plus the foul. 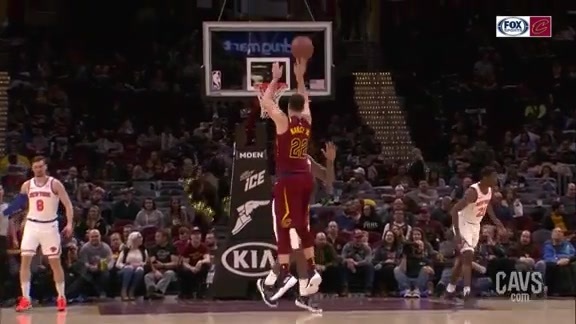 Defense leads to offense and the Cavs get loose in transition resulting in Larry Nance Jr. dishing the nice bounce pass to Collin Sexton for the easy flush. Matthew Dellavedova finds Jordan Clarkson on the back cut for the slam in this ‘More Driven Highlight’ driven by Goodyear. Marquese Chriss crashes the offensive glass and tips home the shot as the first quarter expires. 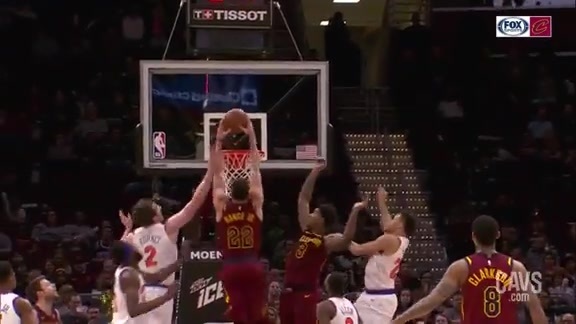 Matthew Dellavedova gets into the lane and floats in the bucket over the Knicks defense. 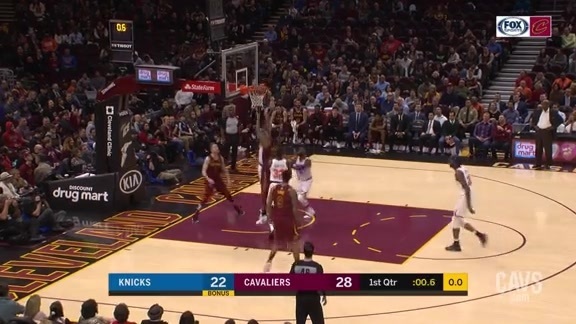 The Wine & Gold push the ball down the floor as Collin Sexton spots Kevin Love open in the paint for the easy two.